What to do with that old sofa? Best ways to restore an old sofa instead of disposing of it. Is your old sofa suffering from neglect? Years of abuse, sagging sofa syndrome, or any of the other thousands of ailments that afflict all old sofas today? Worry not, advances in sofa medicine can bring that old dilapidated piece back to its glory days. With just a few of the right prescriptions, your old sofa will spring back to life. There comes a time when you just have to get rid of that old sofa ( we'll explain later how you can properly dispose of it). However, many times, you can give that old piece of furniture new life. Don't be so quick to throw it out. Here's a few ideas. First things first, clean that thing. Don’t just vacuum it, really clean it. Rent a steam cleaner if you don’t have one and go to town. Take off all removable parts and wash them. Steam clean anything that is still attached from top to bottom. Don’t be lazy or your bad attitude will reflect in a half old looking sofa. After you have steam cleaned every possible piece, vacuum the inside. And when you're done, remember that you should vacuum the inside pretty often, it is not a once in a lifetime thing. Jazz it up a little by making new buttons if the old ones are saggy and worn. Hit a craft store and find the button kits, yes they are real things, then you can pick the right kind of material to match your sofa. Open up the cushions and pillows and add some stuffing. They are not supposed to be wobbly and saggy. Fill them up until they resemble the couch you bought. Those few easy step will make your old sofa spring back to life, but only if it was in pretty decent shape to the beginning with. If you have an outdated junker lying around you might have to put in a little more effort. Let start with the old IKEA classic. It was great when you first got it, now, it's old, dirty and out of style. To make this piece look a little nicer think about TUFTing the cushions, all that really means is ... add some buttons. You need to pull the string from the front of the cushion, where the button attached, all the way through the back. Google it, you'll see just how easy it is to do. This tuft look is certainly more elegant than what IKEA can offer. Now if you're a risk taker, you can consider painting the old style sofa. Textile material can absorb latex paint while still remaining soft, so we hear. If the classic white sofa now kinda looks like the bottom of your shoe then this might be the way to go. If you have kids then we're certain you have totally given up trying to get out all of the permanent marker and other kid-friendly stains. Instead of spending another day scrubbing and washing what is clearly not coming out, grab a few cushion covers and class it up. You can even just do a few cushions and leave the others, assuming they look pristine, to mix it up. If you are crafty you can make no-sew slip covers of your own and open up a world of material choices to best match your home’s vibe. Your old sofa might be a vintage hand me down, if so, then you’ve probably notice it has a couch skirt. Guess what? That's weird. Get rid of it. Tear it off, carefully, and let those beautiful legs show. This one simple move can modernize an old sofa. If you are faced with sagging syndrome, stuff the cushions to reform them, and think about tossing out the cushions along the back and replacing them with pillows. That will save you a lot of hassle, plus it will spruce up your space. You can always reupholster the sofa, there are plenty of DIY ideas online that will tell you how to go about it, or even easier, hire a company to fix it up. There are some businesses out there who can fix up any problem you have with your old sofa, from repairing the frame to replacing springs, rebuilding sleeper mechanism to reupholstering. Check it out and see if it's worth it to you. If you're still reading this, I assume you're in the need of something a bit more drastic than basic restoration – like the setting it on fire method. 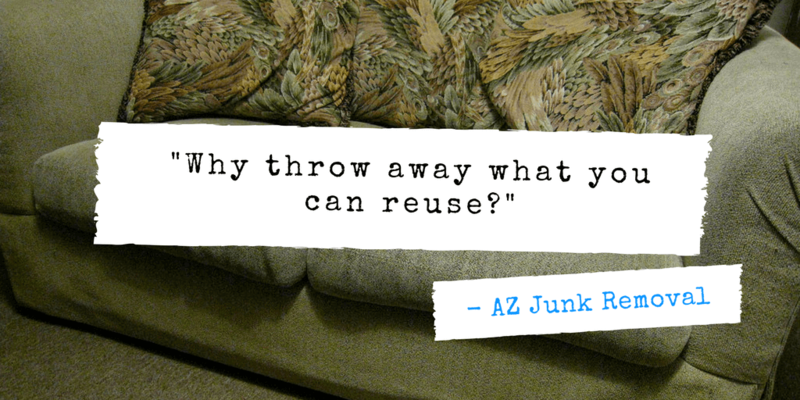 Before you do anything drastic consider calling a local junk removal company, or even better, AZ Junk Removal! We’ll come by and get rid of it for you. You don’t have to do anything but call; just leave the sofa where it is and we will make it magically disappear. If the idea of tossing such a staple is nagging at your conscience, don’t worry, we will find a great home for it. We won’t just drop it off in the landfill, we’ll either donate or recycle it, so it can continue to fulfill its sofa destiny.